Nagoya, Japan – The preference for using one side of the body over the other, as observed typically in human handedness, is referred to as behavioral laterality. Increasing numbers of studies are revealing that, aside from humans, other vertebrates, and even invertebrates, exhibit at least some degree of handedness. Behavioral laterality is advantageous to foraging, defending against competitors, being vigilant against predators, or attending to prospective mates. While lateralized behaviors are thought to be strengthened over time, it remains unclear how they are acquired during development. Yoichi Oda of Nagoya University and Yuichi Takeuchi of the University of Toyama have now revealed how and when behavioral laterality arises. They did this by using the scale-eating predator cichlid Perissodus microlepis (P. microlepis), found in Lake Tanganyika in Africa, at its developing stage. They recently published their findings in Scientific Reports. 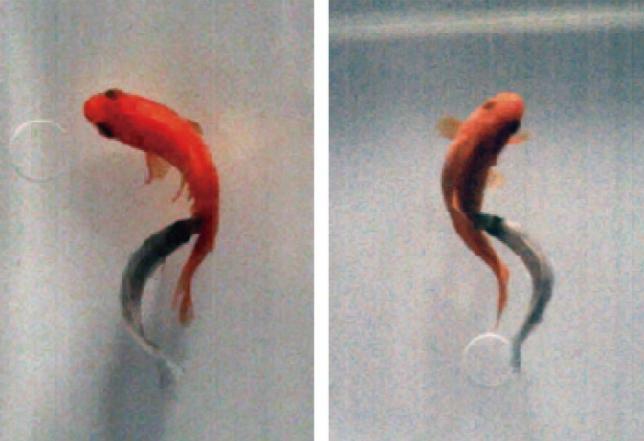 "P. microlepis is an attractive model of behavioral laterality because the adult fish exhibits clear asymmetric mouth morphology and conspicuously lateralized predatory behaviour; left- or right-sided attack of the prey fish," study corresponding author Takeuchi says. "Importantly, we successfully bred P. microlepis in our laboratory – a challenging feat by any measure. This has allowed us to investigate how the development of behavioral laterality depends on experience." The researchers found that nai?ve juvenile P. microlepis with no prior scale-eating experience started attacking prey on both sides, but they gradually tended to attack the side that corresponded to the mouth opening direction during subsequent trials. These findings confirmed the researchers' previous results obtained from stomach content analysis: the stomach contents of early juveniles collected in the same location included scales from both sides, while the scales found in adults were almost all from one side of the prey. Furthermore, the duo noted naitve adult P. microlepis attacked bi-directionally, as did nai?ve juveniles. This meant acquisition of the lateralized behavior is not age-dependent, but rather, an acquired trait. Interestingly, the kinetics of body flexion, in terms of maximum amplitude and angular velocity, during a dominant side attack outperformed those of a non-dominant side attack. Thus, the lateral difference in behavioral kinetics is naturally determined. "Our findings provide qualitative evidence to support the hypothesis that behavioral laterality is reinforced based on experience during development, as well as a new perspective that the stronger side is naturally determined," coauthor Oda says. "The motions and identifiable neural circuits to control the scale-eater's lateralized behavior may provide valuable material for studying the development of behavioral laterality and its underlying brain mechanisms in animals."